Meditation and Mindfulness are increasingly being associated with peace, calm, serenity and general emotional well-being. The way they are portrayed in the popular media, you’d be forgiven for thinking that if you could just sit cross-legged for half an hour a day – all your physical and psychological ills would disappear. It’s not just the media that’s jumped on the bandwagon – treatment centres for addiction, a large number of therapists and even multi-billion dollar corporations such as Google and Microsoft – are incorporating meditation and mindfulness into their employee’s daily schedules. Now I’m certainly not against regular contemplative, self-reflective practices; they are essential for emotional and psychological growth. Regular self reflection, observing thoughts and feelings and focusing on our internal sensations, actually builds up essential functions and pathways in the brain. Mindful self awareness in any form is VITAL for change. But it has to practiced, well, mindfully. I think at this stage it would be beneficial to clarify the difference between the two practices. Meditation has many different forms but it essentially involves sitting for periods of time observing the mind. It is a more formal, silent practice. Mindfulness refers to bringing our focus to what is happening in any given moment, observing thoughts feelings and sensations – bringing full conscious awareness to the present. You can be mindful anywhere. For many people, these practices do allow the mind to quieten down, for the stress response to settle back to baseline, and to ultimately feel more present and engaged in life. But for some, they don’t. Many of our ‘problems’ such as addictions, dissociative disorders, eating disorders, hyper-activity, excessive busyness, excessive worrying, procrastination – are actually defences against deeper internal emotional pain. Intense meditation can shatter those defenses, unleashing a torrent of overwhelming thoughts, feelings and sensations on an unprepared psyche. In her article about the dangers of mindfulness, Dawn Forster reports the experience of a 37 year old woman, Clare, who was sent on a 3 day mindfulness course as part of her workplace training. Clare isn’t alone in her experience – such is the increase in reports of the negative effects of mediation that some prominent psychiatrists are speaking up. And these aren’t experts bashing meditation and mindfulness, they are active practitioners and supporters. Dr Willoughby Britton, Associate Professor of Psychiatry at Brown University has been an avid practitioner of meditation for over 20 years. Yet, because of the stories that she hears about the adverse effect of contemplative practice, she has set up 'the Dark Night Project' – in an effort to investigate the issue. “Meditation is not the “warm bath” it’s been marketed as in this country” Britton states. And this is the thing. It was never meant to be. It was meant to be a path to spiritual awakening. And spiritual awakening often requires going to some very dark corners of our mind. David, a resident at Britton’s ‘Cheetah House’, describes his experience as a result of meditation. “I started having thoughts like, 'Let me take over you,' combined with confusion and tons of terror……I had a vision of death with a scythe and a hood, and the thought 'Kill yourself' over and over again." Many of the clients I see in my practice, initially can’t sit with their thoughts and feelings for more than a couple of minutes – it’s far too distressing. Our ability to tolerate cognitive (thoughts) and emotional distress, is a direct result of the kind of childhood we have. If we’ve had an adequately warm, nurturing and emotionally supportive childhood, our capacity to handle difficult internal states is quite high. This doesn’t mean that our childhood was necessarily all rosy and without difficulty. We need to periodically experience stress and distress for our brains to develop the capacity manage them. But without emotional support, and help with processing stressful events, our brain doesn’t develop this capacity well. Dan Siegel, Clinical Professor of Psychiatry at UCLA, calls this capacity the “window of tolerance”. 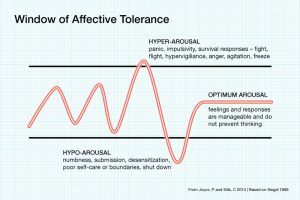 If you have a wide window of tolerance, you can handle a range of emotions of varying intensity, without being de-railed. But with a narrow window, difficult emotions can send you into a ‘hyper-aroused’ state – anxious, panicky, manic or even psychotic. Or a ‘hypo-aroused’ state – dissociated, depressed, even suicidal. Mediation and mindfulness can catapult you out of your window of tolerance. But done slowly, carefully and ‘mindfully’, they will help you to widen your window and as a result, learn to tolerate and experience a wide range of emotions. If you are contemplating starting a meditation or mindfulness practice – don’t be put off. Psychological growth involves facing difficult internal experiences. Just take it slowly and be mindful of being mindful. I would love to hear your thoughts on this topic - so please leave a comment below. Having severe abandonment, narcissitic abuse, sexual abuse and adrenal exhaustion, I contemplated meditation. I really looked into it but was aprehensive about the letting myself be mindless. It never sounded right to me. Affirmations were good but attaching the imagination to them I found difficult. I am grateful for this analysis of meditation and mindfulness because caution needs to be applied. I use relaxing music and telling myself the truth to be a good start towards healing my issues right now.